Our work with LED lights, tritium vials, and specialized antennas, segwayed into something we could not have predicted. This purpose built antenna was developed for a group of tactical specialists that we are not allowed to name. It is unlikely you will ever see them in use, but we are going to make them available in limited numbers. 2: identify which antenna was on the HT in total darkness. Our IPX6 antennas are color coded to make it wasy to select the correct antenna for your frequency. In the Anytone 3318 models that have the memory bank function, when we program the radio, we match memory banks to color codes. 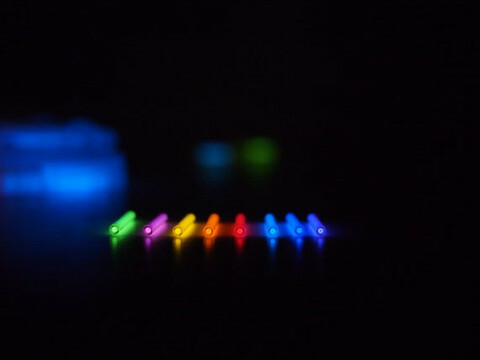 The solution was to place an array of three 1.5x6mm Tritium Vials around the base of the antenna, and each array is color coded to differentiate the antenna color codes. Of course this development has obvious merit for consideration for elite members of SAR groups, guides, and expeditions. Perhaps also, given that this is not available anywhere else in the world, as the perfect item for the man who wants to be distinguished by the best tools money can buy. Each antenna has a tritium vial which has a unique color that denotes its color code*. Above: the 160-170 mHz antenna's color code is green, so the tritium vials at the base are also green. The Marathon and Nite tritium watch hands are shown for comparison purposes vs the tritium vials at the base of the antenna. * Note on color codes. 'She Who Must Be Obeyed' said, "Clem, don't try and buy a black tritium vial for the black antennas". "Gosh", I said, "Now that you mention it, I don't see one in the suppliers list!" So the black antennas will have orange vials.